Trendsetters from the recent past have shown that Fashion and Technology will work together in cycles, for uplifting one another, to shape the future of fashion for generations to come. Recent and past times show that with high-tech technology involvement, fashion will definitely reach audiences with just click buzz or swipe modes and a classic example to showcase this theory, is the advertising on social media platforms like Instagram which reigns the e-commerce industry. Be those swanky hand accessories to those funky running shoes future fashion trends will involve an ounce of innovation and creativity. The developers, designers or innovators will need to experiment and implicate any idea that springs in their mind, to create an end product which is technology driven yet fashionable and some of the experiments highlighted in this post will depict the same. There has not been a single time when technology wasn’t present for fashion. Be it the classic 1970s Boombox or the millenniums’ iPod, these gadgets always made entertainment a gallant mixture of technology and fashion. Fashion industry taking the gimmicks of sci-fi technology has improvised itself in every way possible. 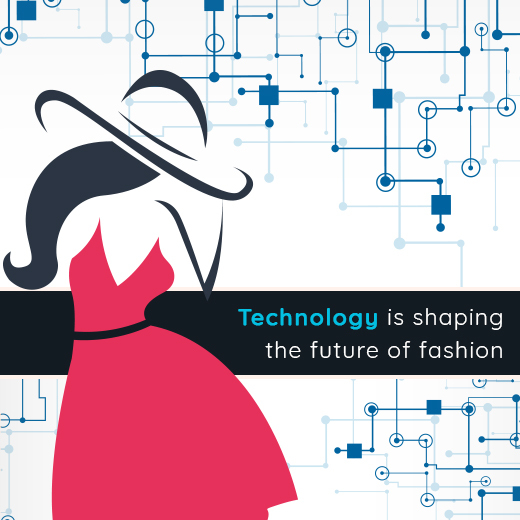 From online shopping to fashion forums, QR codes to fashion shows and technical clothing to digital fitting rooms for e-commerce portals, the chalk, and cheese of technology and fashion have been intertwined competently to bring fashion locally for every individual. World famous Fashion-Tech Designer and innovator Anouk Wipprecht has used technology flawlessly to give her idea a perfect blend, with her Spider Dress. The dress has sensors and movable arms which flaunt a bold outlook marking a defined personal space for the user. Wearable technology is something which brings out a strong impact on not just trends but the overall economy. With 3D print technology for apparels and shoes, customers will have the leverage of innovating the design and print it for yourself, with complete customization options beyond shape and sizes. Various styles, prints, textures can well be sort through and put across in an image digitally for creating your fashion piece from one location to another. Since the time technology dominated every field, and not just fashion there has been no looking back. Future of fashion is highly motivated by that innovative spark and out of the box thinking, which came to reality using tech solutions for every endeavor. There will soon come a time, where every product that we use is technology driven and yet be environment friendly, be that colour adaption technique to fabrication of material, just like the nanoparticle dress or the NFC ring a power accessory which controls everything without the need to charge; fashion will be imprinted on each of us using the technology-driven tools and techniques.